Anyone who knows me knows that I love to read. Maybe it's because I am an English major, or perhaps it's because I love to lose myself in a world that is not mine. Maybe a little bit of both. One delemma that I have found myself up against is what do I read next? I often seek out opinions of other readers, search the NY Times Bestsellers list, or scour GoodReads to see if they can find me the perfect match. It's kind of like speed dating when it comes to finding a good book, a keeper. First impressions - you peruse the bookstore or virtual Kindle shelves to see a cover that will captivate you. I know I know, don't judge – oh stop it, we all do it, and there is nothing wrong with that! It's all about first impressions right? Kinda like dating! The Interview - This is where you find out their name (author/title) you find out their interests (genre) and you find out their intentions (plot). Only then can you decide if they're worth your time to continue on and see what's written on those pages. The First Date - This is where it get's good. Sure they've passed the initial interview stage. You're interested. Now it's time to have some one-on-one time. So you make a date (buy or check out the book). You sit down and really figure out if this will have any hope of working out. Usually the first date (or first few chapters) will tell you a lot. Are you bored out of your mind? Are you having a hard time paying attention? Are they nummah than a hake (It's a Mainer saying)? Or is their story just not something you're into? All things that pentane to both scenarios in life. The commitment - This is the serious stage. Do you make the commitment to be monogamous? Do you make the commitment to see this through? Usually it's not a conscious choice. It either works out and there is that undeniable passion or you close that chapter and move on. Sometimes those chosen books will be the love of your life. You will hold on to and cherish them forever. Sometimes, once you're done you toss it to the side and look for something new. Something different. Some will hold a special place in your heart long after they are gone. I have so many special reads that hold that place in my heart. Some I have even, long after the relationship ended, rekindled it...and I fell back into that deep love. Since I am a sharer I want to once a month share a book that has captivated my heart, so you too can fall in love. I found this book by way of speed dating and was instantly drawn in by the title. I am a Mainer and that is our slogan. The Way Life Should Be is literally written on the Maine Welcome sign as you drive into the state. So I knew it instantly had some potential. Just like when you find a guy who likes cats...I mean come on! I quickly read the plot and was hooked. Angela Russo found herself in Down East Maine (which is actually up the coast...confusing I know) by way of online dating. She had lost her job and decided to move to a place she had forever dreamed about, but had never actually once visited. She took a chance on a guy who was just a screen name, a place she had only seen pictures of in magazines and her grandmothers Italian recipes. Little did she know, she would be captivated by the small town she landed in and her need for change would outweigh her lack of a job, friends, or money. This book really takes life changes and makes you feel like you are right there with her. You feel her pain, happiness, loneliness, and the harsh Maine winters. 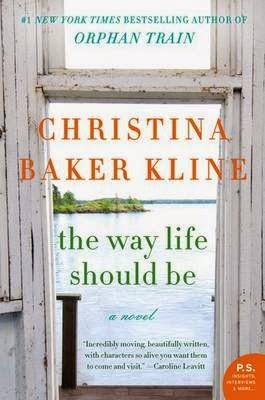 The author, Christina Baker Kline, did such a phenomenal job at portraying Maine in not only a beautiful way but a way that locals see and feel it. Stay tuned for more of my past loves! are you signed up for amazon affiliate links? if you link it through them and i buy the book (which I want to!) then you get a (small) commission! i'll wait to buy it if you're going to do that! I was signed up before but I just went to reactivate it and it is saying that Maine is not an eligible state .... I'm going to have to look into it further because doesn't seem right! Yup Maine is not an Eligible state unfortunately :( But thank you for thinking of me! Definitely buy the book it was a very quick read and really good!